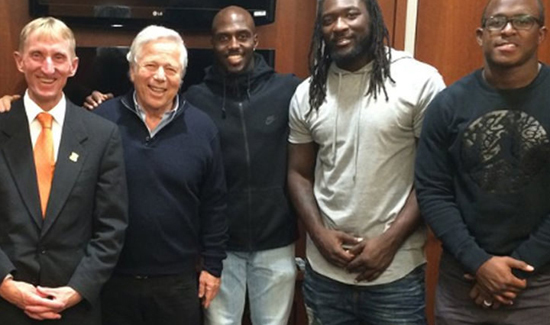 Patriots owner Robert Kraft (above, second from left) and three Patriots players had the opportunity to see Boston police work up close when they rode with officers on Halloween night. Kraft, along with players Devin McCourty, LeGarrette Blount, and Matthew Slater, spent Halloween chatting with Boston Police Commissioner William B. Evans, watching a basketball game between police officers and kids, and taking part in a police ride-along. The purpose of the visit was “to show their support for the department and to learn more about the challenges officers are facing locally during difficult times nationally,” the Boston Police Department said in a statement. Evans discussed community policing and football with the group before they all went to the Teen Center at St. Peter’s in Dorchester, which provides teens age 12 to 19 years old educational and recreational activities, to watch a basketball game between police officers and neighborhood kids. After that, Kraft and the players took part in a ride-along with members of the department’s Youth Violence Strike Force to get a view of local police work. “We appreciate them stopping by during their precious downtime,” Boston police said.